I have used your guides in previous expansions up until it got into a monthly subscription based. Now however I came back and thought, let's see what's the reputation guide is up to after reaching level 120. And what do I find? Absolutely nothing!!! 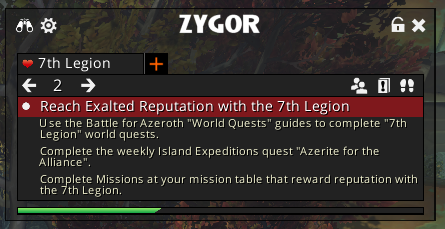 Your guide to reach exalted is literally: do world quests, do weekly island expeditions and do every mission at the mission table. AND THAT'S IT!!! Sure, you need to do those parts, but (almost) everyone knows that. But what about tracking all the quests and especially worlds quests at the other factions island? Those are big deal of getting the rep!!! Did you guys just started slacking big time with this expansion? WTF is that advise? You used to have pin point tracking of quests. Now there is nothing on the other factions' island (and we are 3 weeks after lauch!). You can guess which one finger I'm showing to you right now and whether I'm going to continue my subscription or not with you. I hope you buy something nice for yourselves with that money. You guys slack! You have become lazy. You should not do that. Bad for business. Bad for everything. Nope. not a good thing. No. No. No. Did you do the War Campaign guide? That should cover quests on the other faction's islands. As for the world quests, if you look in the Dailies section you'll find world quests guides for the other faction's islands as well. We have said many times that not all guides have been made for BfA and they are being worked on. It was like this for the previous expansion releases as well. Blizzard keeps having less and less time for an expansion in beta giving us less time to create guides before the launch. So the guide tells you to first unlock world quests, which opens world quests on both islands, and which guides to use to do so. Then it explains how to get rep, and which guides to use to do so. I'm not sure what you feel is missing, since all of the guides it tells you to use are written, released, and available to use. In case you're unaware of how to use our world quests guide, simply open your map and click the icons for world quests and guides for the quests will be automatically loaded, telling you what to do to complete the quest, unless it's one of the few remaining world quests that aren't written quite yet. Last edited by Zygor; September 1st, 2018 at 07:24 PM.